Clubs & Socs week in 1st year of college - I came late into the hall and stumbled upon the Suas society stall. I signed up to volunteer for the Literary Support Programme and it went from there. I wanted to experience something new in college and volunteering with a society was top of my list. I wanted to try to make change in the things that made me angry or I thought was wrong with the world. 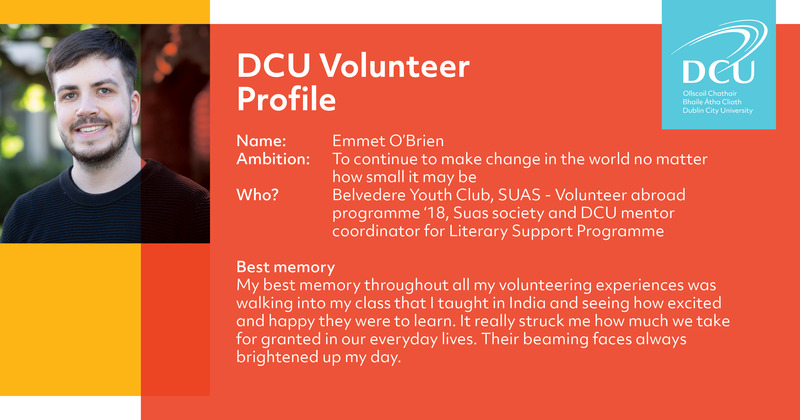 Education is something that really interests me so the volunteer work I’ve done really revolved around that. I wanted to give back to people and learn more about global perspectives and volunteering in general. My best memory throughout all my volunteering experiences was walking into my class that I taught in India and seeing how excited and happy they were to learn. It really struck me how much we take for granted in our everyday lives. Their beaming faces always brightened up my day.